This is a partial preview. Full document is 51 pages. View large preview. You rise to much HIGHER levels of strategy in innovation and transformation, and you acquire real competitive edge through the comprehensive coverage and novel approaches. 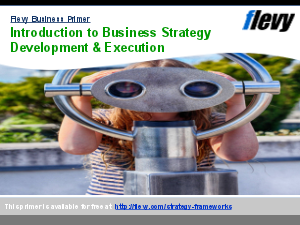 You SAVE a lot of time and effort in the preparation for the strategy formulation process. You and your team members are put in the ideal MINDSET to tackle breakthrough strategy. FIVE POWERFUL ENGINES of Breakthrough Strategy In One Discount Pack. Description can be found for each guide on Flevy. This holistic pack is what you need if you are serious about taking your business on a quantum leap journey. Each one of the five guides was meticulously prepared. This strategic package was developed by Dr. Stephen M. Sweid, a business consultant, researcher and trainer with over 20 years consulting experience on the international scene: Europe, USA, Middle East and Far East, covering a wide spectrum of industries, including hi-tech. Consultant specializes in quantum leap strategy and innovation.